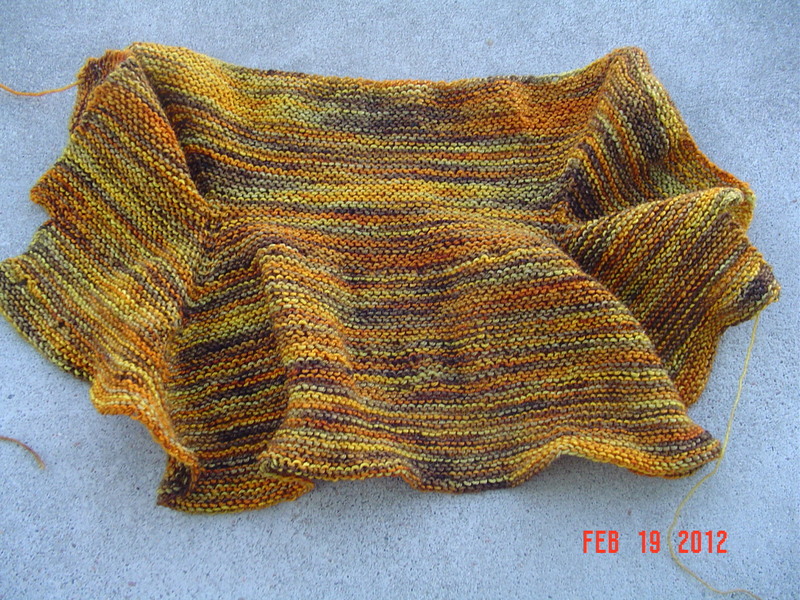 I must admit, once the shawl was done, I became very eager to finish up my first Skew sock. I was left with only the short rows and the cuff to do, so after bringing it in to work, it was close to complete. Now, I must explain last evening to you, it was one of those nights that was particularly mild for February, and it was full of thunderstorms. 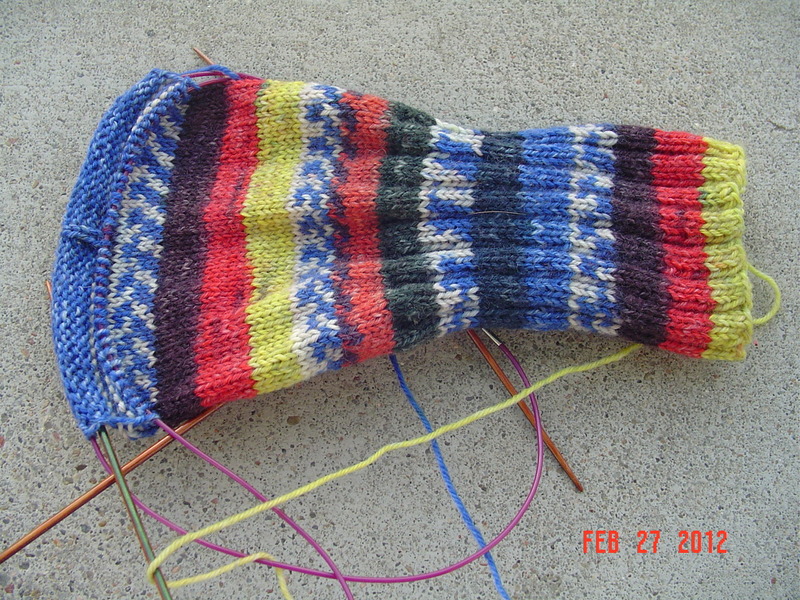 This made me both happy and antsy, and I found that once I completed the skew sock, I wanted an entirely new project. So, I sat down with my tea, and whipped up a mini sock in white. Mom has been asking for one of these for her Christmas tree for quite some time, but I never have white yarn to make it with. I had just enough scraps to make one, and even managed to get it soaked and blocked last evening. Thus, today, I have two random socks without mates. In other news, the mini sock was not enough for my case of castonitis, so I began a neck gaiter in Jojoland Rhythm. I’ll consider this a quick project I can use for one of my pay it forward 2012 gifts. So-this is my second sample project for dyeabolical yarns. To be honest, it probably isn’t a shawl pattern I would have picked on my own, but it is designed to show off the hand painted yarn, and it is very effective in doing so. It starts with a little bit of a lacy border at the top, then moves right into linen stitch. The only other time I’ve done linen stitch is for the Rock and Weave socks. I enjoyed it then, and I enjoy it now. I keep thinking a scarf of this pattern would be fabulous, but I never get around to it. The shawl then moves into a drop stitch pattern that I was already familiar with, having used it for the waves on the Creatures of the Reef shawl. (Gosh that was a long time ago!) The next stitch pattern was this drop stitch cross over pattern, which was completely new to me. I enjoy learning new things, but these were quite a challenge, and forced me to play knit doctor regularly, dropping 2 or 3 stitches about 3 rows down in order to get the stitches to cross, but not cross each other. It was not exactly simple. But the effect is very interesting. 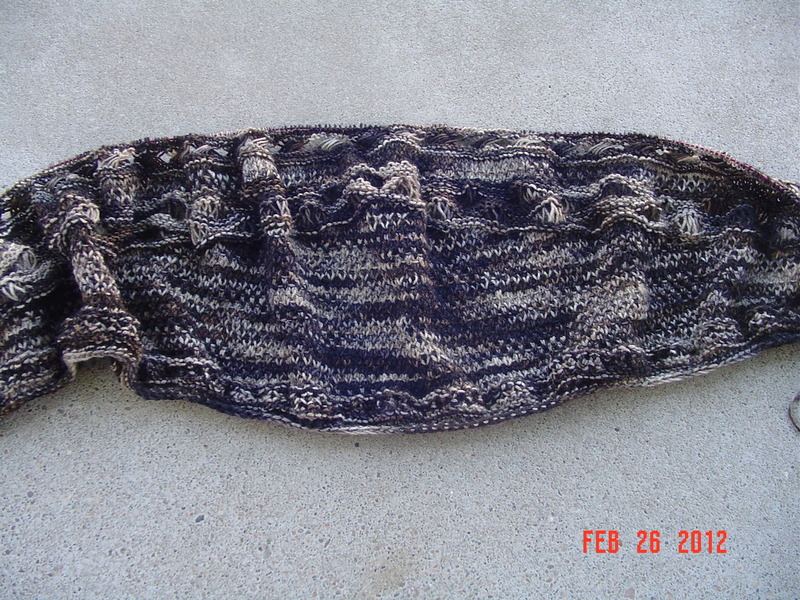 There were a couple options for the final stitch pattern and bind off, I chose the lacy loops. 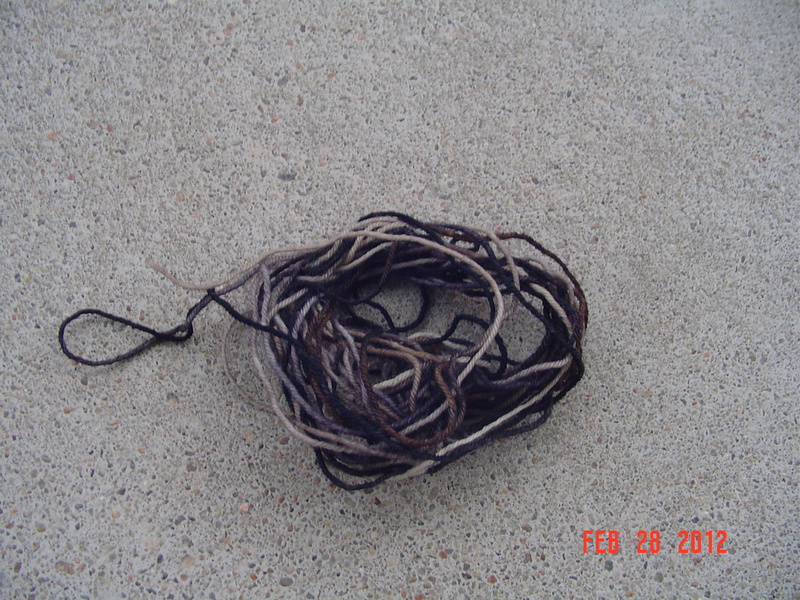 I was worried about having enough yarn, but I just made it with what I had. I didn’t have to do any backtracking or fudging with the pattern to make it work. I finished last evening, and thought about waiting to block it. But, in the end, (and despite the pain in my knees from my run that afternoon) I decided to just get it over with. It blocked out quite a bit bigger than I expected it to. 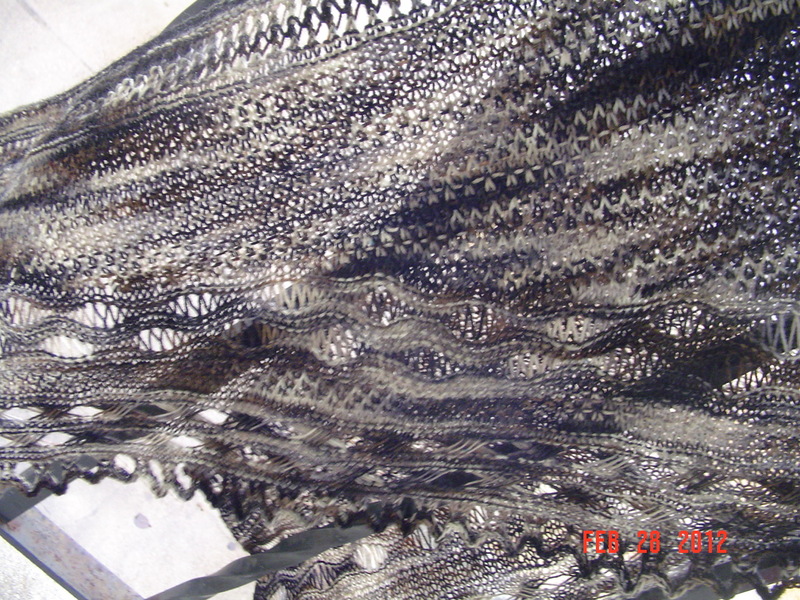 I am amazed that, even having knit lace since 2007, I am still surprised at blocking. I figured that the linen stitch would be a bit tighter than normal lace work, and wouldn’t stretch as much. That was not at all the case. One more transformation complete! And, I felt the need to show you that I was, indeed, cutting it a bit close in the yarn department. This is all I had left over. I’ve seen closer calls than this, but it sure made me nervous! I am not yet ready to show you the shawl I’ve been working on. It is not quite off the needles, though I have just one row and a bind off to finish. It would be pointless to show you another in progress picture because it really doesn’t look any different than it did yesterday. 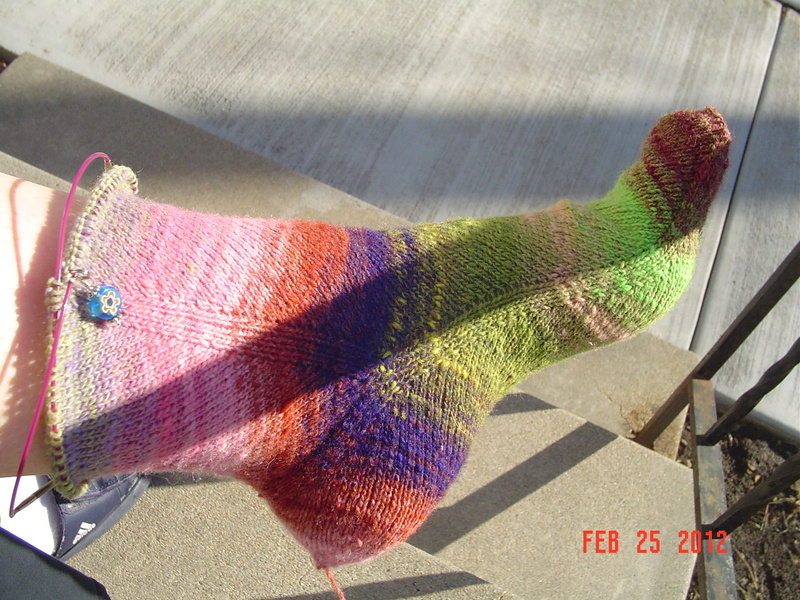 So, instead I can show you a picture of the socks I’ve been working on for my mom. During Month O’Socks, I made the white then dyed brown pair. Since mom has grown to love her bright socks, I looked around for what might be the most garish sock yarn I possessed, so that this year I can make sure she has socks from both ends of the spectrum. To be fair, I didn’t pick this color. I lucked out on a work horse sock yarn destash, grab bags of 5 skeins for a super cheap price, and I believe I purchased 3 grab bags. Out of all 15 skeins, I only have 2 skeins left to knit. So, I think it was a pretty decent purchase. That is, IF you were to ignore my huge yarn stash. I have a soft place in my heart for stripes, another one for work horse yarns, and yet another for a good deal on yarn, so those grab bags were basically irresistible to me. This particular yarn is Opal’s Mexiko. It is bright! The pattern is my go to pattern for socks for mom, the Vintage Socks gentleman’s plain winter socks seem to fit her perfectly, and she likes the dutch heel. I’d like to get these done by the end of March, since she will be in town and I can hand them off without having to pay for postage. I’ve been diligently working on this shawl since Valentine’s day. The baby sweater took priority, but this has been my other project. 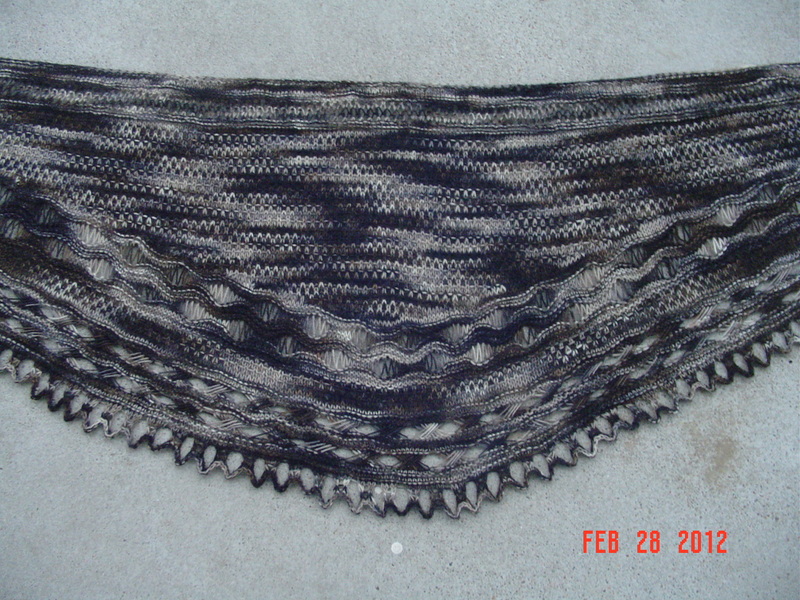 The shawl is interesting, composed of linen stitch and dropped stitches to show off the handpainted yarn. I love how it is coming out, but I suspect you’ll be able to appreciate it far more once it is done and blocked. I am on the last clue now, so it shouldn’t be too awfully long before I have a completed object. Since I am in the midst of a row on my shawl, and not currently knitting on anything else, I decided to take a picture of the skew sock which I haven’t knit on in awhile. 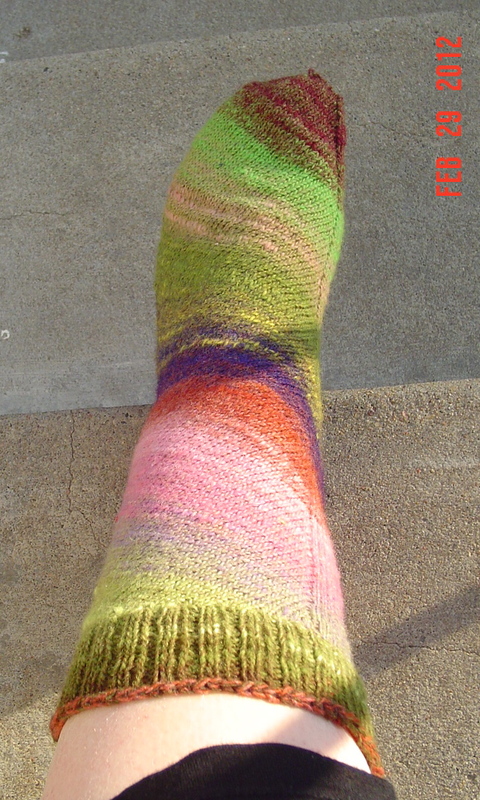 The yarn is noro kureyon sock. I absolutely love the color. From this angle it is hard to see the skewness of it, but the other side is not nearly as long. This will be a project to complete once the shawl is done. The baby surprise jacket really is brilliant. Looks fantastic! In the end, I had to do a 3 needle bind off on the sleeves. I could not get them to seam nicely without it, and it left a sweater that had no place for a baby neck. So I just did what worked. The yarn is so so pretty! I would not have thought of using it in this way, but the colors blend so nicely. I am, in the end, rather proud of this one! It is a baby sweater. I swear! 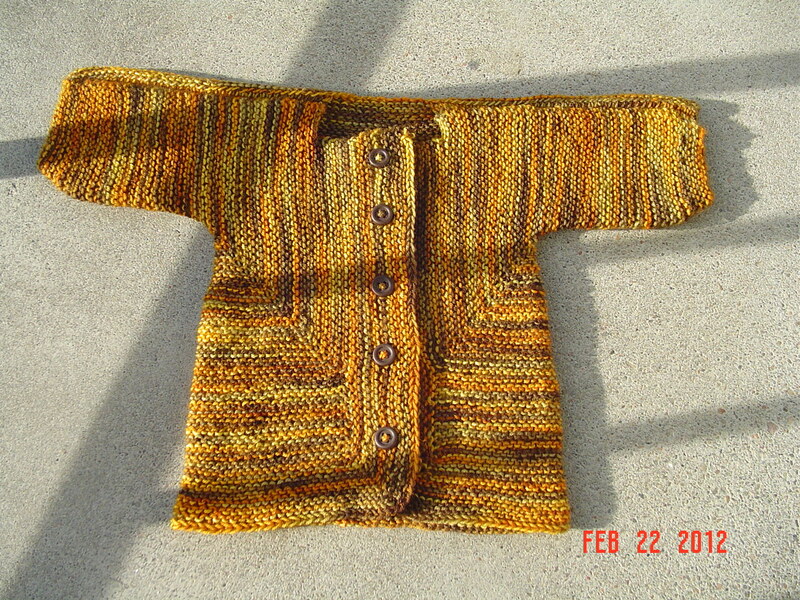 This is the baby surprise jacket, which I have never done before. 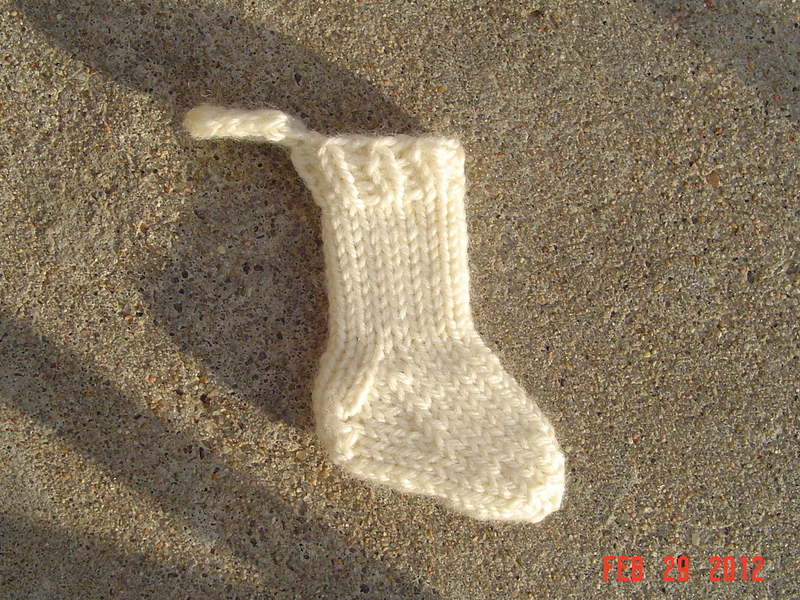 While I really didn’t understand the instructions, I also realized that Ravelry has like 16 thousand of these on the project pages, so I am assuming it can be knit if one just does. When I had about 6 rows left before the finish, I finally figured out how it was going to work. I am so fortunate to have been chosen as one of the sample knitters for Dyeabolical. The yarn is her strong arm base I believe, and it really is a stunning color! This yarn actually knits up in a way I love to have wool yarns knit up. Firmly, with great hold and definition. Strong arm is a perfect name for this base!